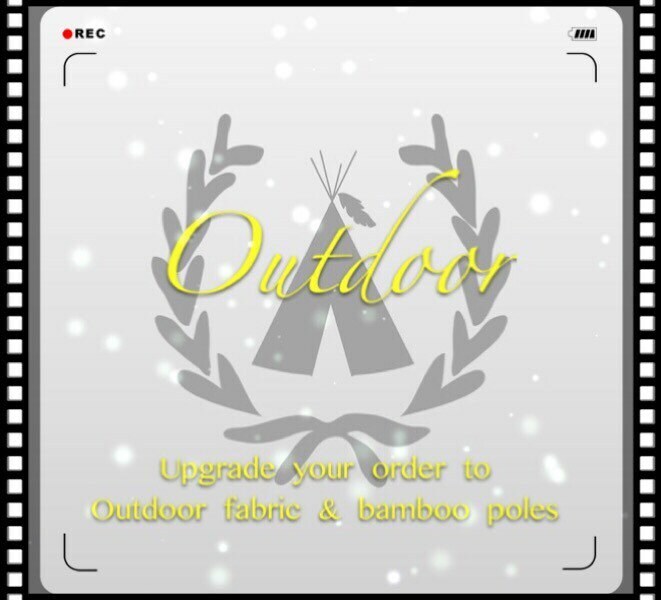 You can choose to upgrade regular cotton canvas base Medium/large/XL size teepee to outdoor cotton base and nature bamboo poles. For the XL teepee outdoor upgrade, there will be a sewing line at the back panel due to the fabric width limit. WATER REPELLENT & MILDEW RESISTANT & Nature Color COTTON canvas. **The poles will be replaced by nature bamboo poles which are more friendly for outdoor use. **The thread will be replaced by polyester thread. 1. What is different with the cotton outdoor fabric comparing with polyester synthetic outdoor fabric? We use outdoor cotton fabric because It is much more breathable comparing with polyester fabric. Polyester outdoor fabric can be used to make cushion covers, umbrellas, or awnings. But cotton fabric is definitely a better choice for tents. It is a Breathability, Longevity And Durability outdoor upgrade. 2. Can I leave it out overnight? Yes. You can leave it out overnight. If you don't need it in a long time and want to bring it in for storage, please make sure the fabric is fully dry before storing. 3. How to clean the teepee? Super easy to maintain, if it gets dirty, you can use the hose in you backyard to give it a shower.